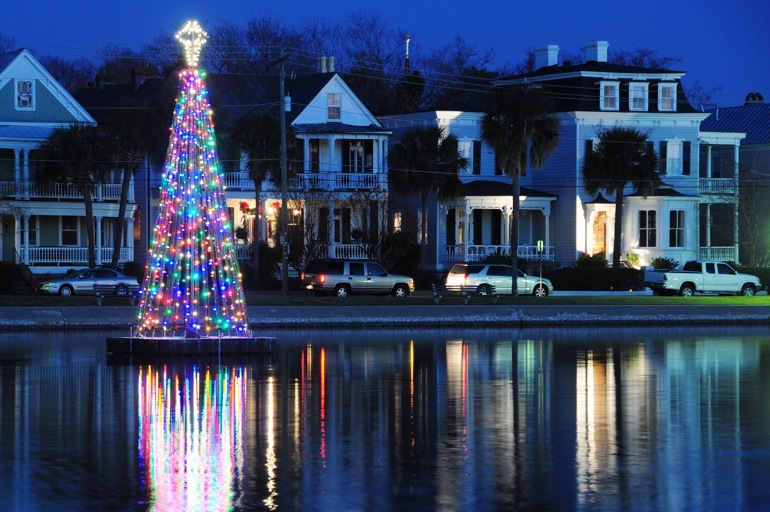 The scene on Colonial Lake in downtown Charleston, S.C., was an impromptu image for my Christmas card this year. At this writing, I'm residing in a new state. I know my posts to The Offlede have been slow, but with this new home and new job, I plan to change that. My new town: Charleston, South Carolina. For the newspaper of record here, The Post and Courier, which is the South's oldest daily newspaper, I'm covering breaking news and police agencies through words, photos and videos. I had a trial by fire in my first week, as you can see here. 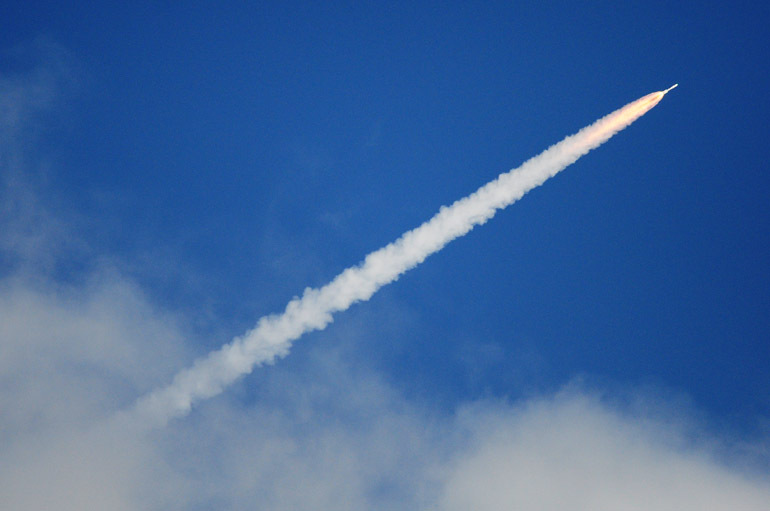 An Atlas V rocket took the Mars Curiosity rover into orbit in November. 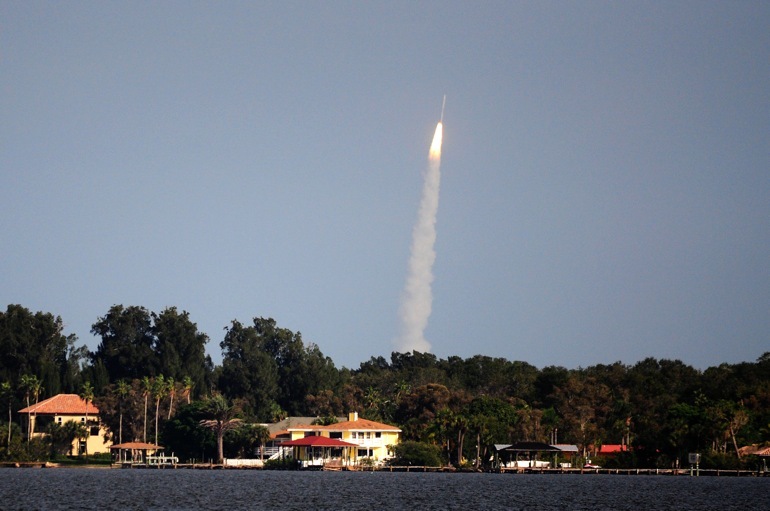 I shot the launch from the Indian River in Palm Shores, far south of the pad (30 miles or so). It was far off, but the rocket's rumble still could be heard. 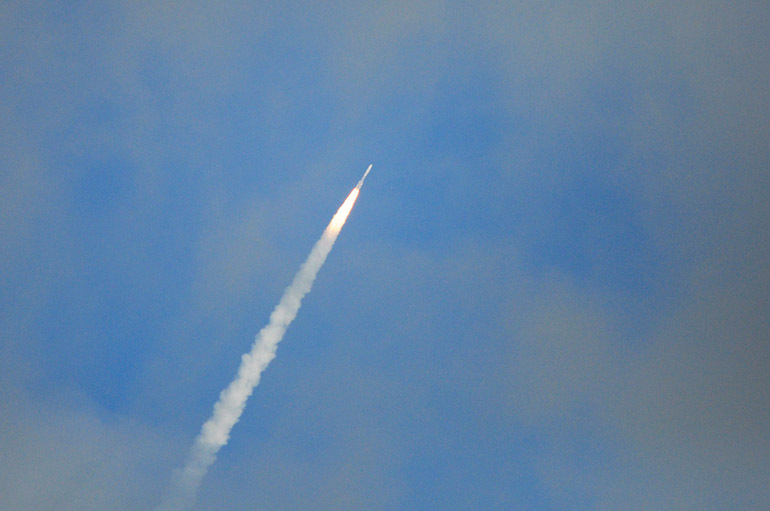 This proved to be my final launch in Florida. I saw some ants building a home in the parking lot of my apartment complex one late afternoon. 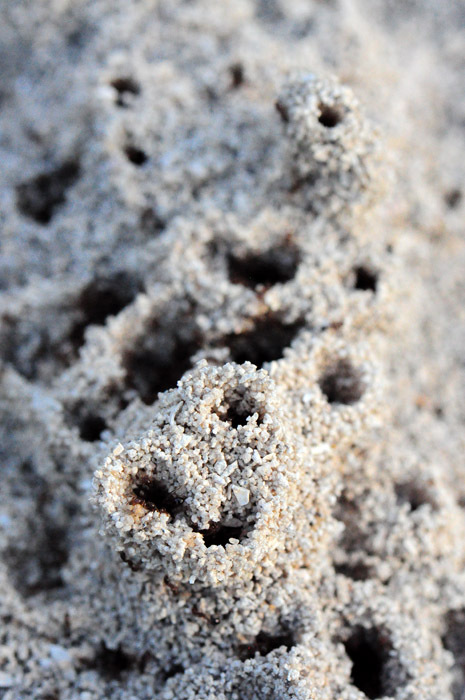 It looked interesting through a macro lens. 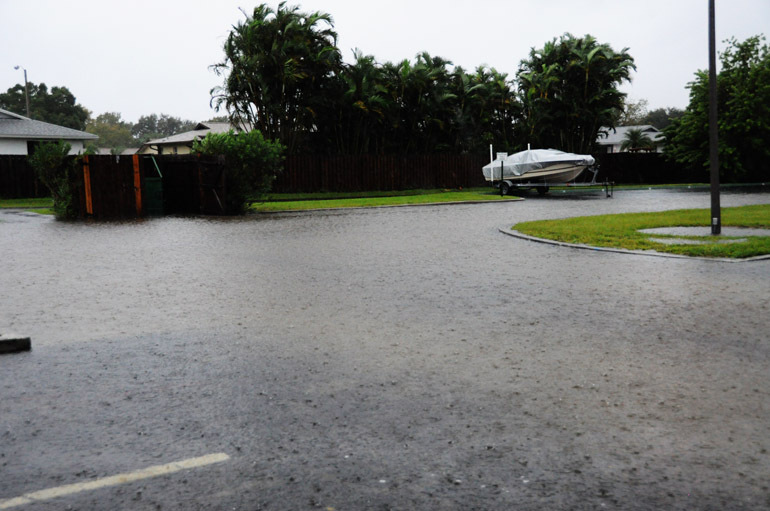 On the weekend of Oct. 8, or thereabouts, a tropical moisture-induced storm dumped a dozen inches of rainfall on the Space Coast. It was wet and windy but nothing really special. 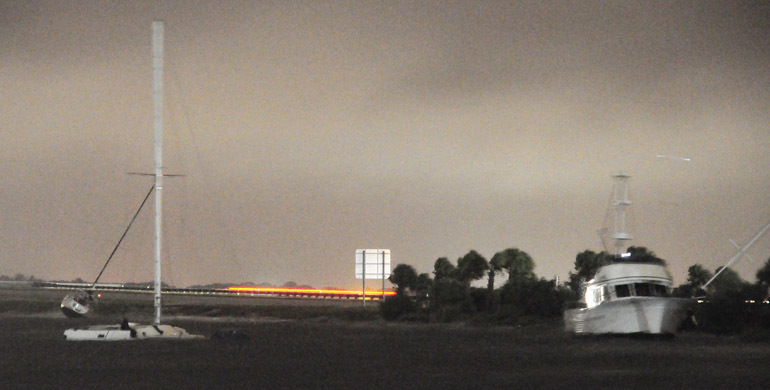 Some boats got knocked loose from their moorings, however, and crashed into the Pineda Causeway. There was some lightning associated with the storm, but it was raining so hard that you couldn't really make out the bolts. 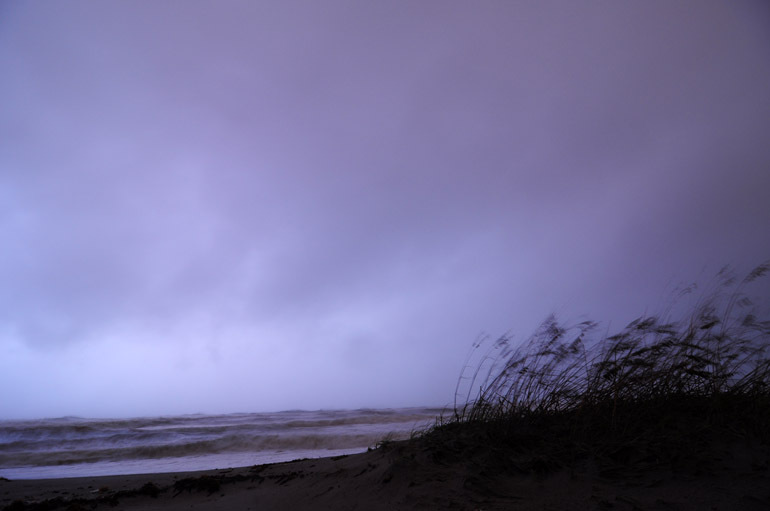 I pushed the limits in attempting to get a lightning shot on the beach, risking being swept to sea in a sudden surge of ocean water. The parking lot at my apartment flooded. But that was typical during heavy rainstorms. 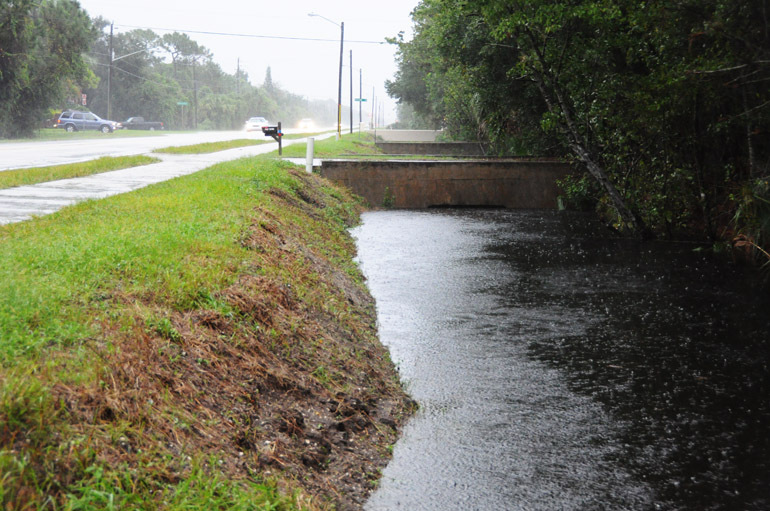 We had a rainfall deficit before this storm, so there was no catastrophic flooding. 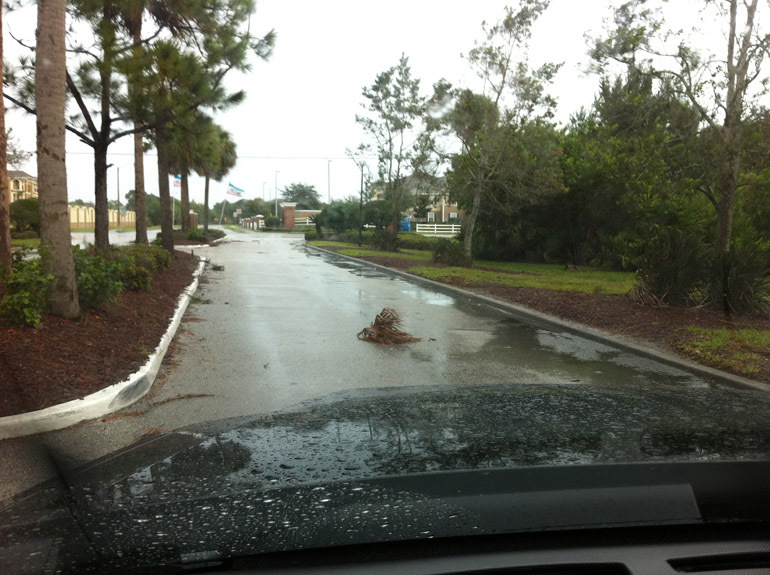 But branches did block the roads. 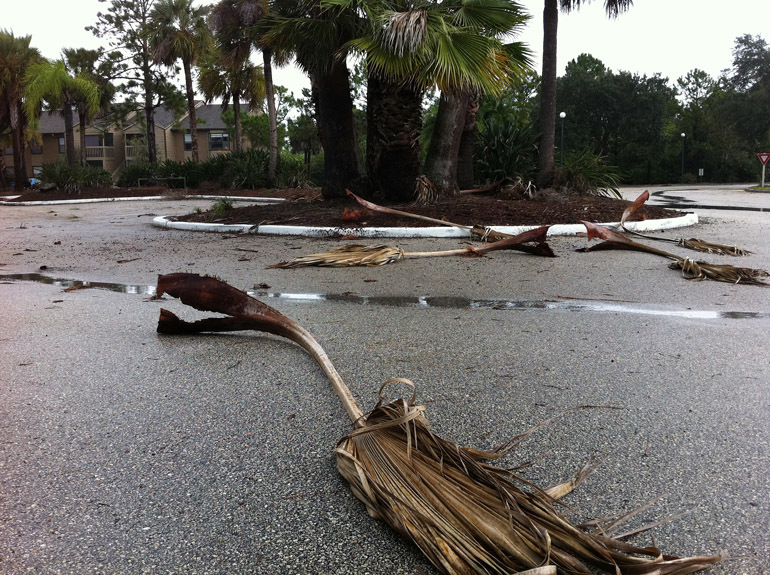 Storms that destroy palm trees or parts of palm trees are good storms, in my book. 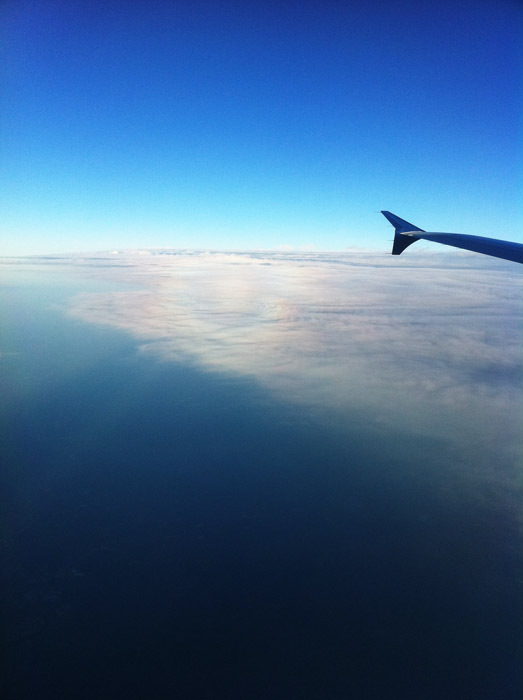 I flew northward to visit a girl at a few points during my time in Florida. 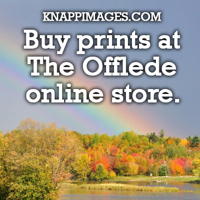 One of the first "cool" fronts of the season happened to be dropping southward for this trip. 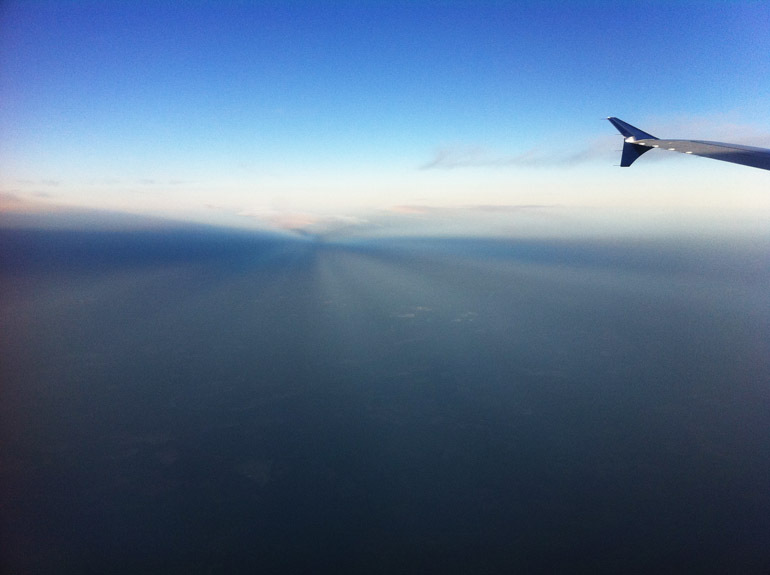 It made for some interesting cloud cover during my two plane rides to get to where I was going: West Virginia. I took some shots with my iPhone. I woke up ridiculously early for the first flight, and the sun was rising during the first leg of my journey. 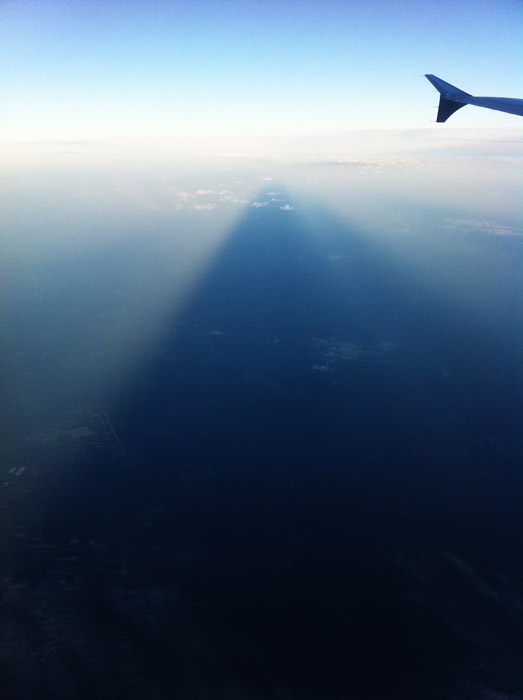 This photo shows a long shadow cast by unseen clouds on the horizon. This shows the clouds associated with the leading edge of the front, somewhere in Georgia, I'm guessing. 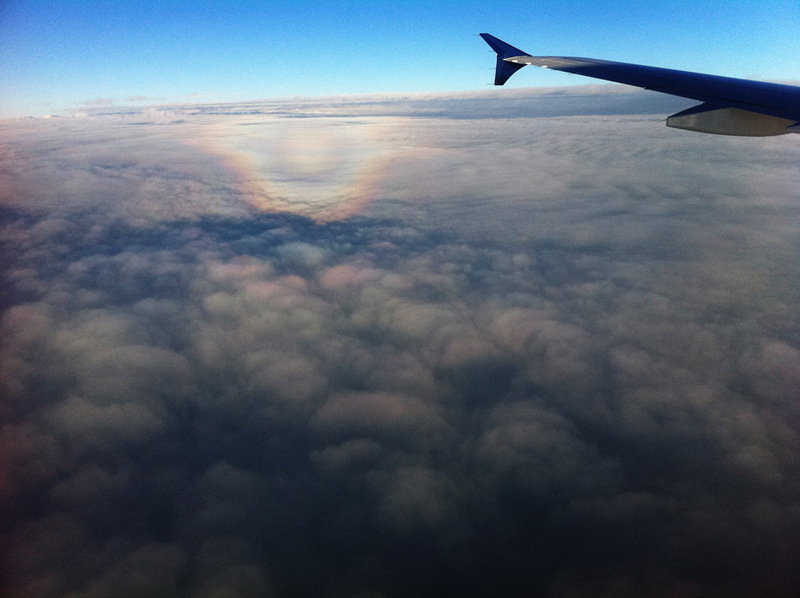 The plane cast some sort of circular iridescence onto the clouds. I see this often when the sun angle is right. 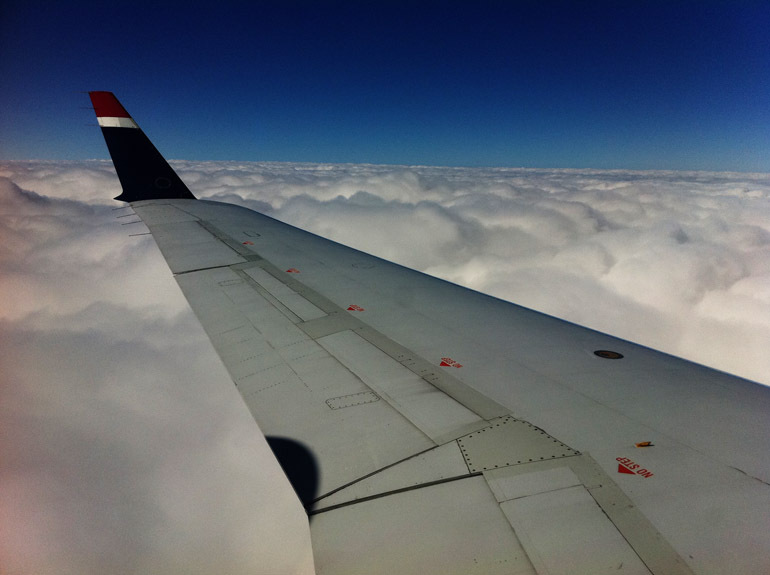 The clouds were thick as the plane finally descended into its final destination, where it was cold. 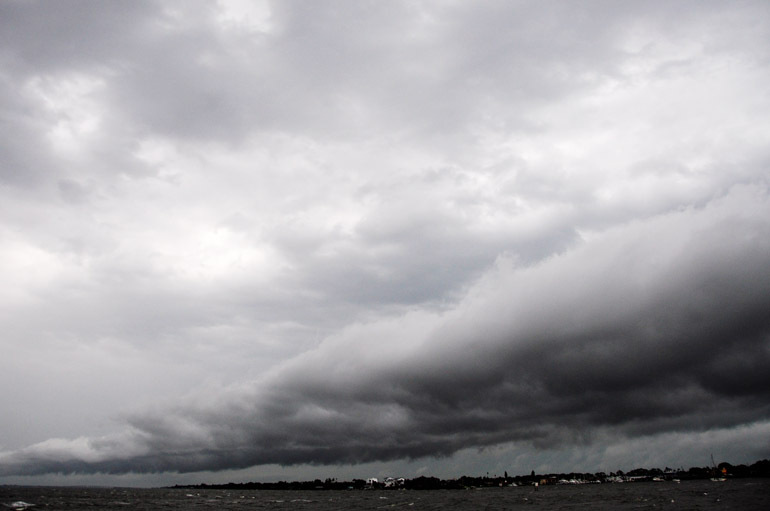 The front also caused a record low back in Melbourne, Fla. Something in the 60s. Frigid. 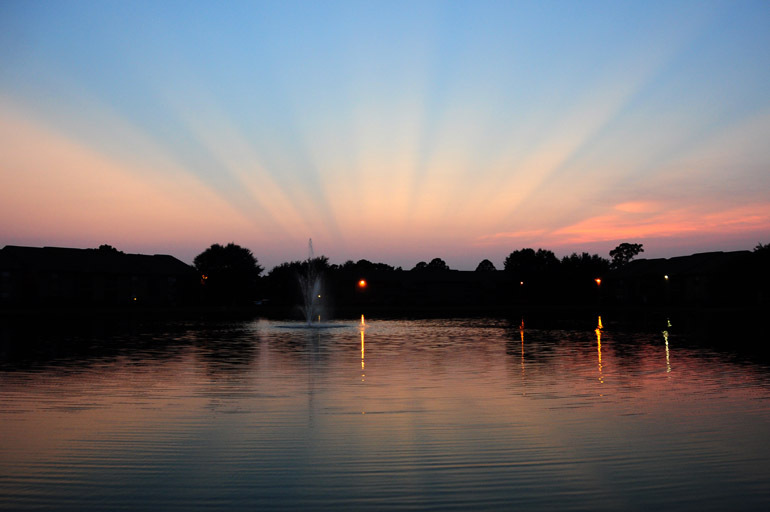 There were lots of sunsets in Florida. As there are in most parts of the world. But I had the opportunity to view more of them when I started working regular daytime hours during my final few months in the Sunshine State. 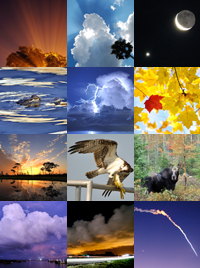 Sept. 11, 2011, started as THE Sept. 11 did: clear blue sky. But we did have some pretty storms pop up in the afternoon. 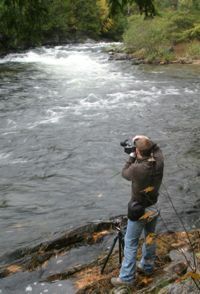 I started photographing them at Lake Washington, just west of Melbourne. 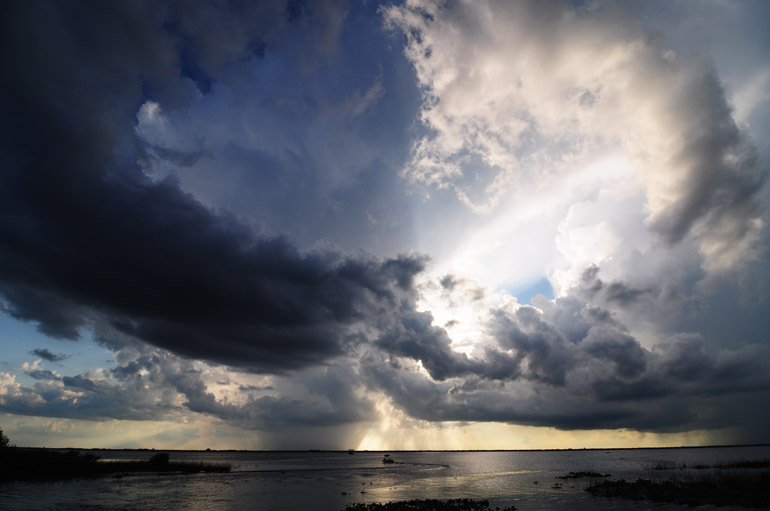 Above, a rain core on the horizon. 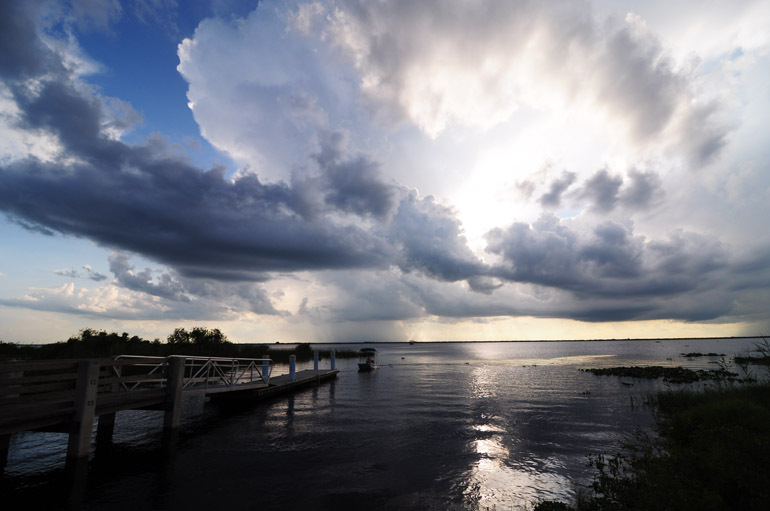 I always liked watching the boaters come to shore as the clouds rolled in. This was producing some serious lightning at the time. There were several close strikes that raised the hair on my neck. But I couldn't catch any of them on camera. 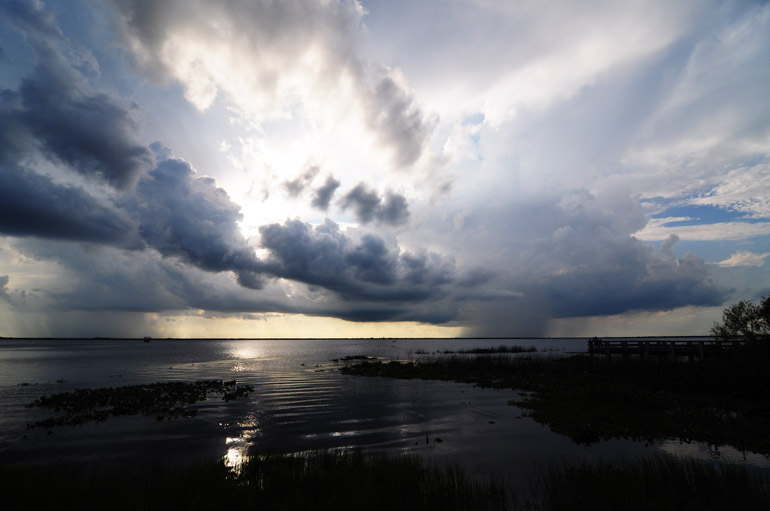 A storm popped up late in the day well to the north, near Titusville. 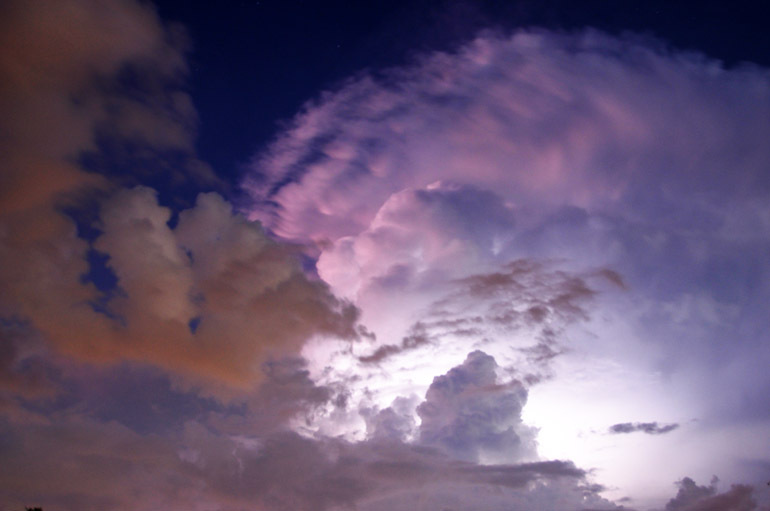 I photographed the cloud tops from Melbourne, where you could see bolts traveling from cloud to cloud. Fantastic display. Just not easily captured by a camera that's far off. Really just some white clouds at night. Some of these photos are really digging deep into the archives. 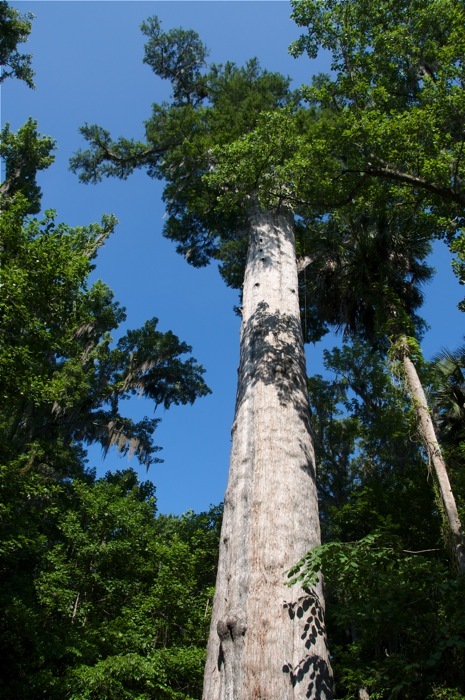 This was from a visit with my cousin in Seminole County, where Big Tree Park has a 3,500-year-old cypress that's not as tall (thanks to a hurricane) as it once was. But it is still rather wide. One day, when I was helping a friend's family member move, I noticed these circular cloud formations over the golf course in Melbourne. They're known as lenticular clouds. 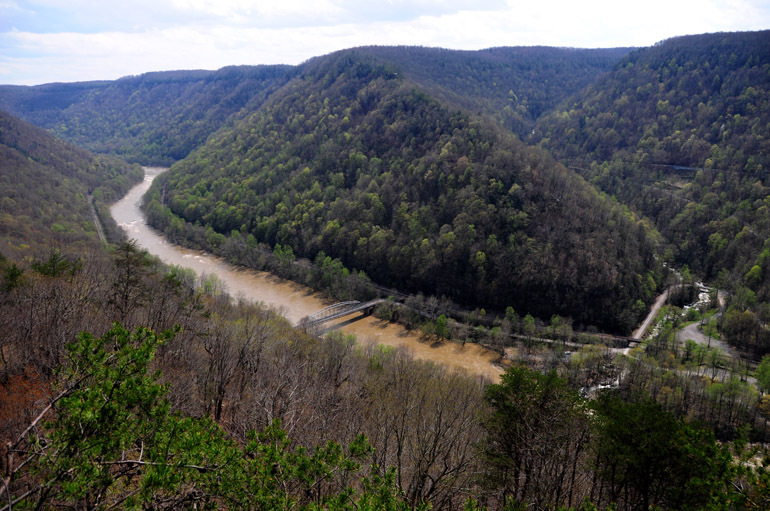 They form at higher altitudes and are a cumulus varietal. 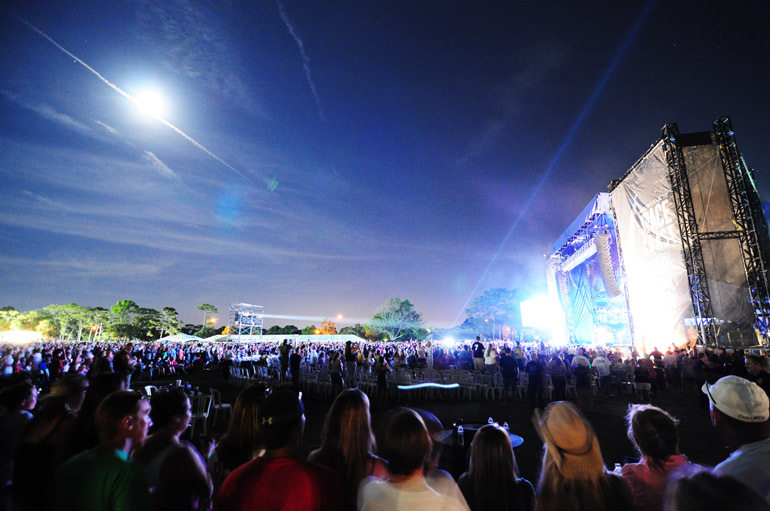 Brevard County had its first large outdoor concert in April: the Runaway Country Space Coast Music Fest. 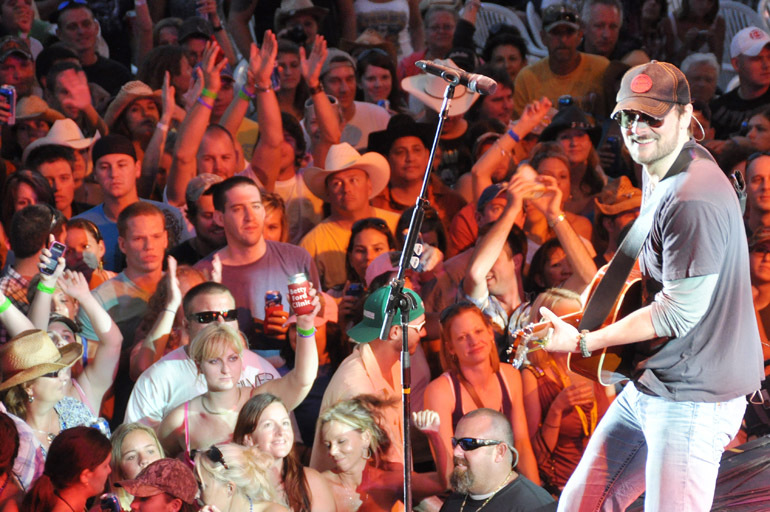 Here, Eric Church, one of my favorite country acts, performs as a fanatic rushes the stage. 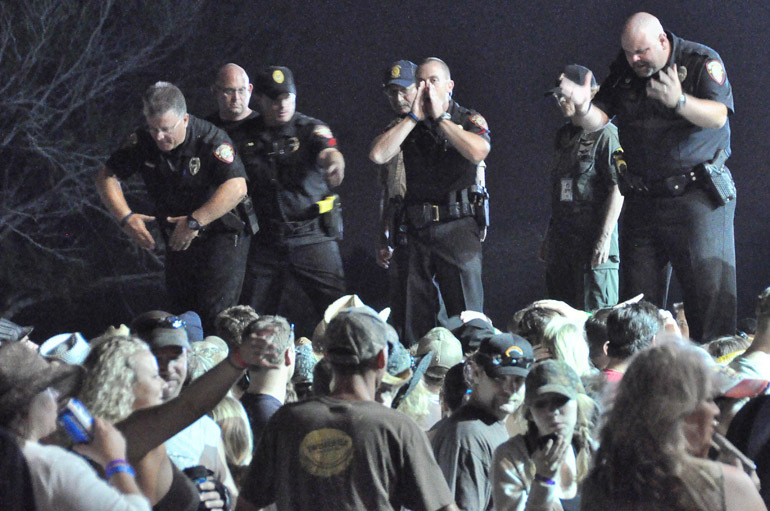 I helped the newspaper cover the event by tweeting and addressing several security issues that popped up during the first night of the two-day festival. The Melbourne Police Department tried their darnedest to make it safe. Here, they're yelling at people to move away from the stage. 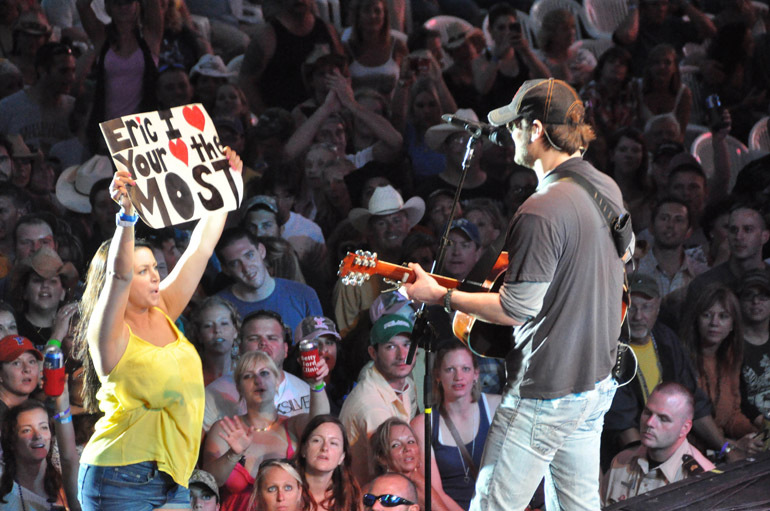 I got back stage, of course, where this pic was taken. 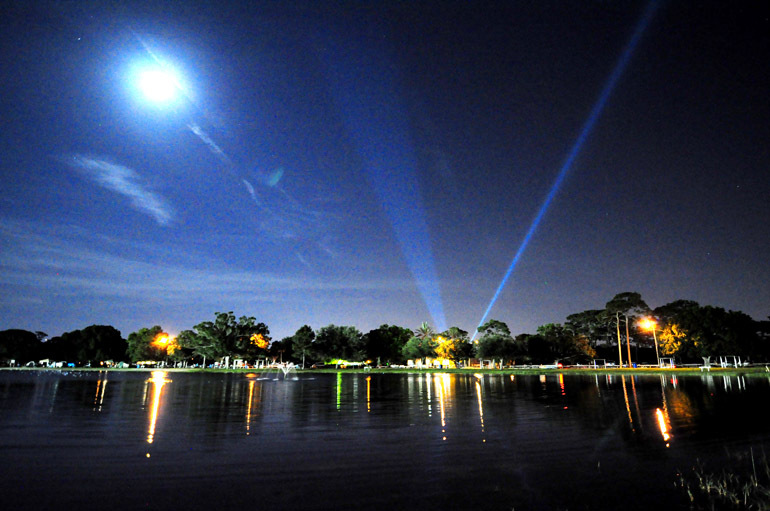 The spotlights over a lake at Melbourne's Wickham Park, where the festival was. 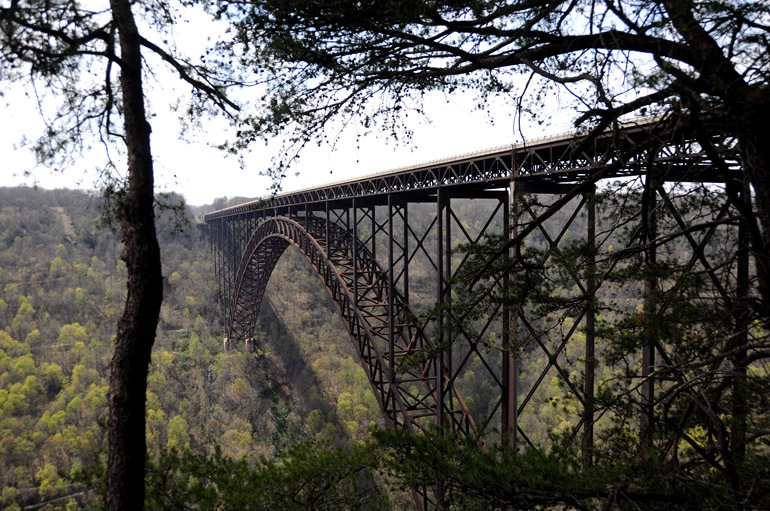 In a trip to West Virginia, a beautiful girl and I visited the New River Gorge Bridge in Fayatteville. The leaves were just starting to grow at this point of the spring. 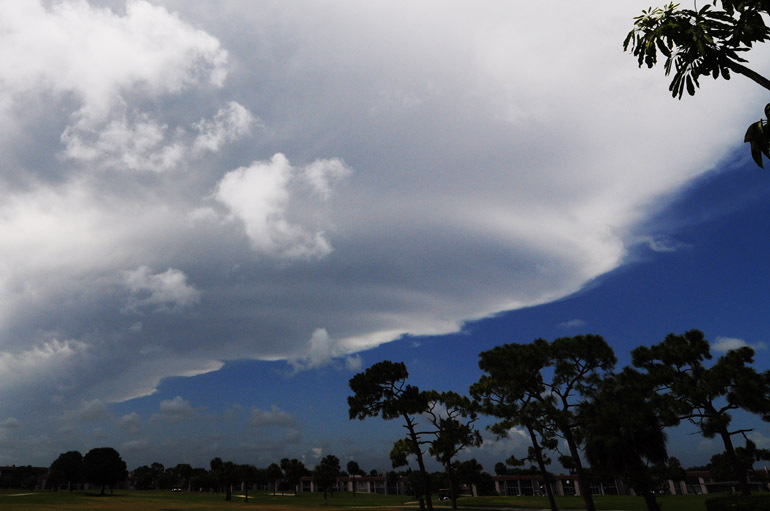 On March 30, with the passage of one of the final cold fronts of the season, there were tornado warnings, golf ball-size hail and 85 mph straight-line wind gusts in Brevard County. 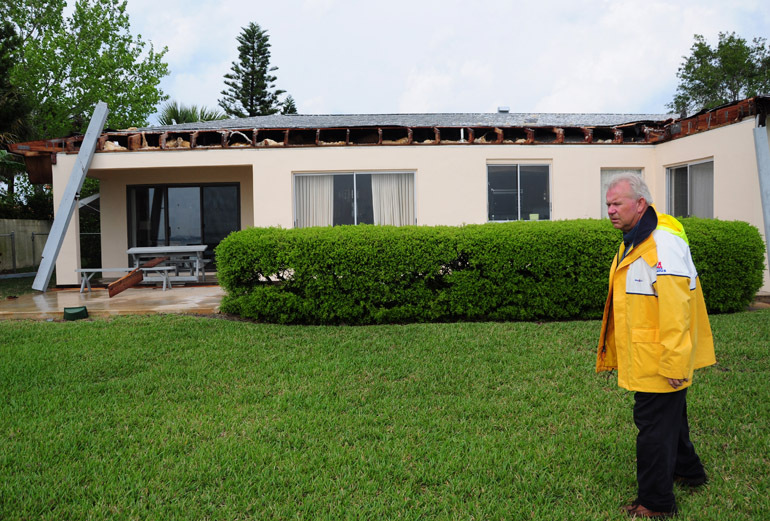 A patio roof was ripped off this home in Melbourne Beach and deposited in the street on the other side of the house. Elsewhere, trees fell on vehicles and houses. The building inspector examined the home, which had some leaks inside but was still habitable. The storm ended up being classified as a derecho, a Spanish word meaning "straight" that's a term for a widespread wind storm. 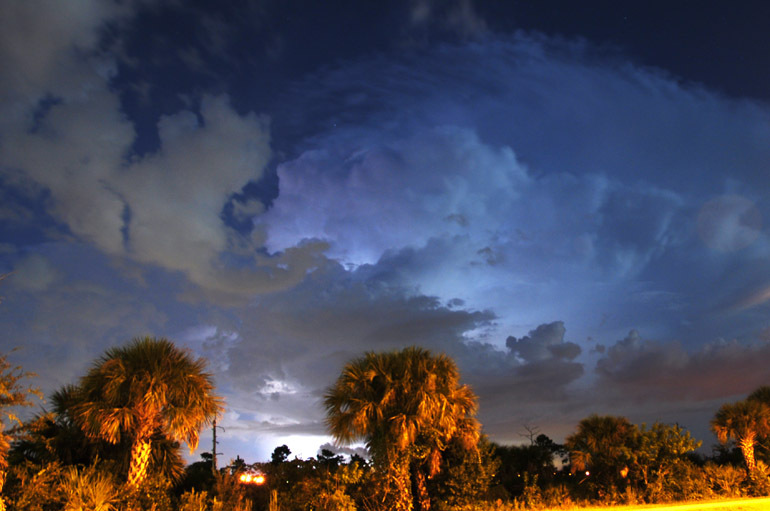 They're rare in Florida, and meteorologists hadn't seen one like it in a long time. 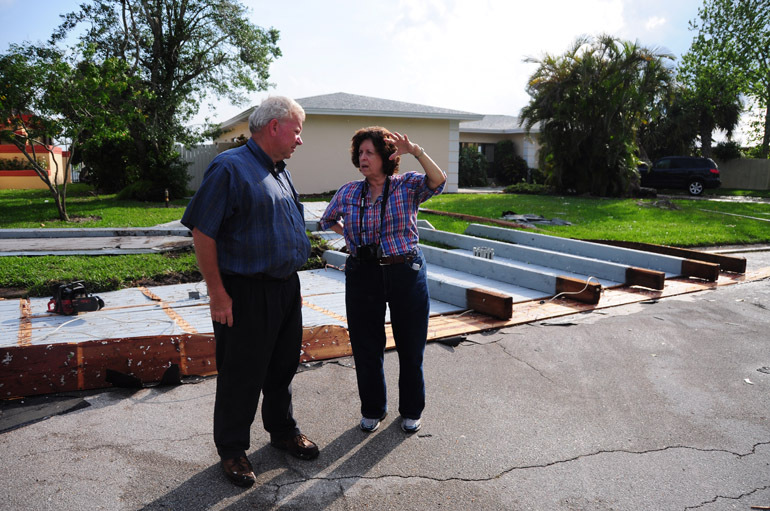 All of Central Florida saw some sort of damage from the system. 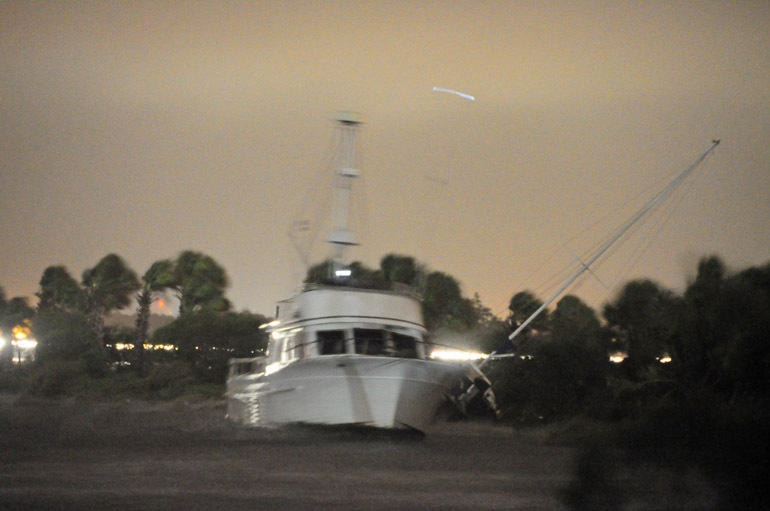 The next morning, Brevard had another squall line that moved through, bringing only sporadic damage. 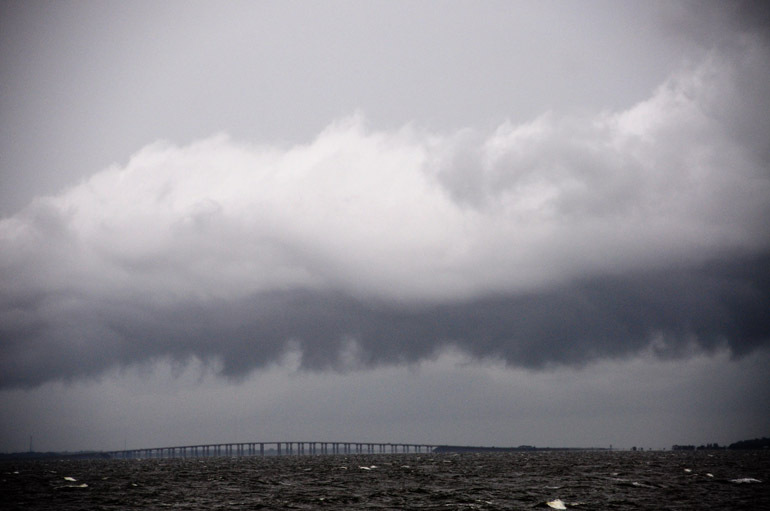 This was the scene on the Indian River looking toward the Eau Gallie Causeway. 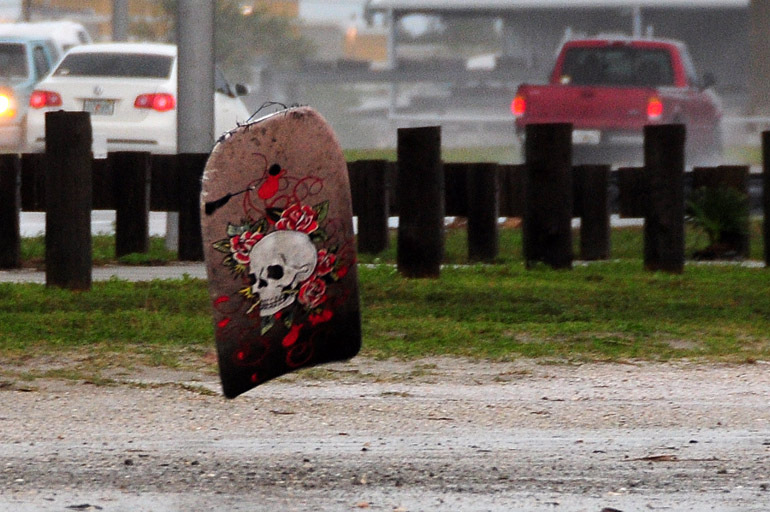 The next morning, Brevard had another squall line that moved through, bringing only sporadic damage and blowing this boogie board through a parking lot. 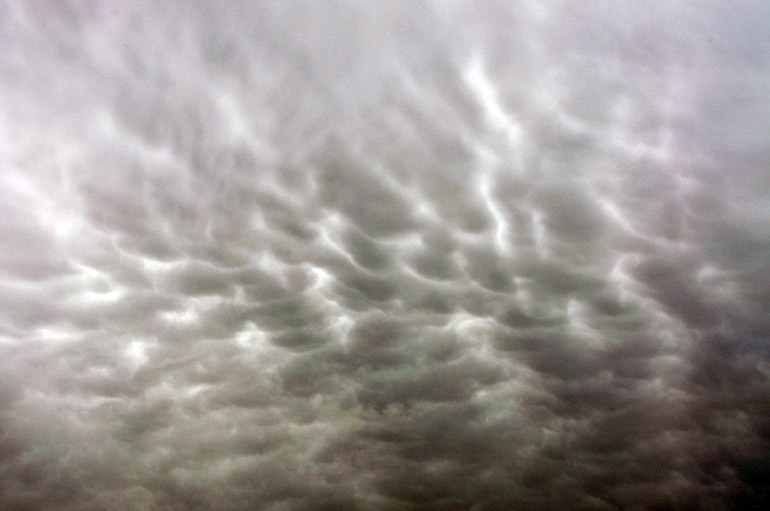 These are some mammatus clouds that I shot during the past two or four years. They are so named because they supposedly look like the mammary gland of a mammal. 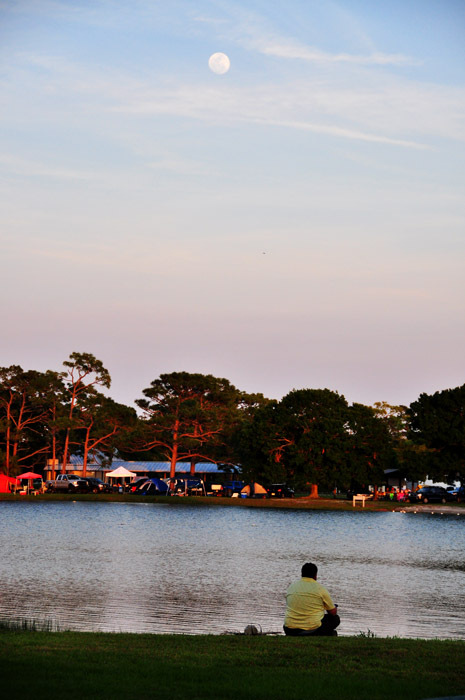 Melbourne occasionally had blimps pass over en route to various sporting events either to the south, in Miami, or to the north, in Daytona Beach. 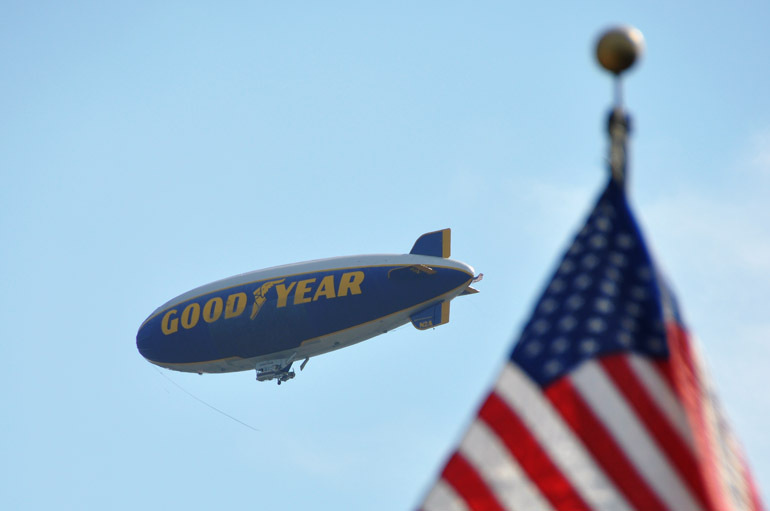 I caught this Goodyear blimp on camera as it sailed above my apartment complex. Alas, a photo of me working during my first week on the job as a breaking-news reporter at Florida Today. 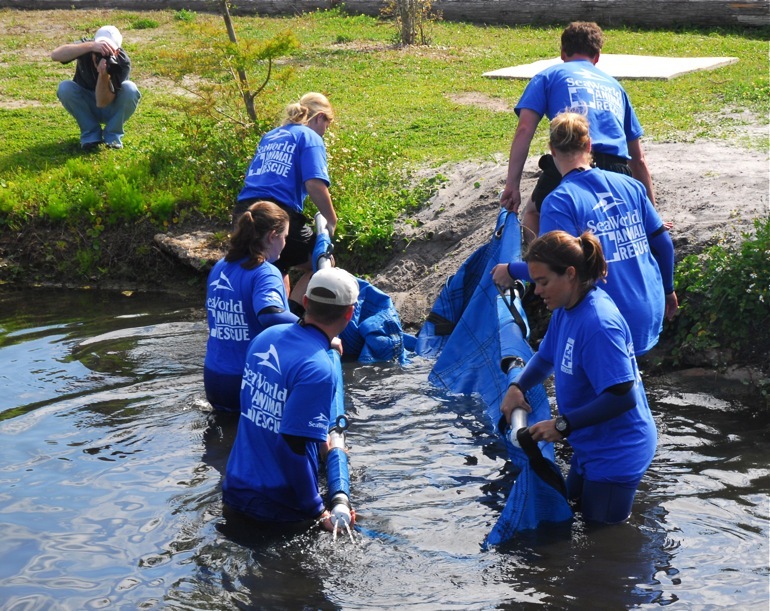 You can hardly recognize me, but I'm shooting members of Sea World's animal rescue team as they pulled an injured manatee from a canal in the Satellite Beach area. 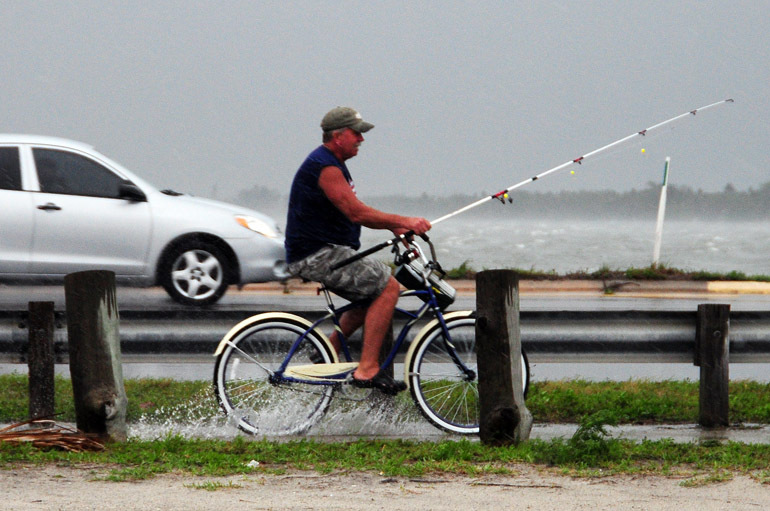 Credit for the photo goes to Malcolm Denemark, a photographer at Florida Today.